Welco me. 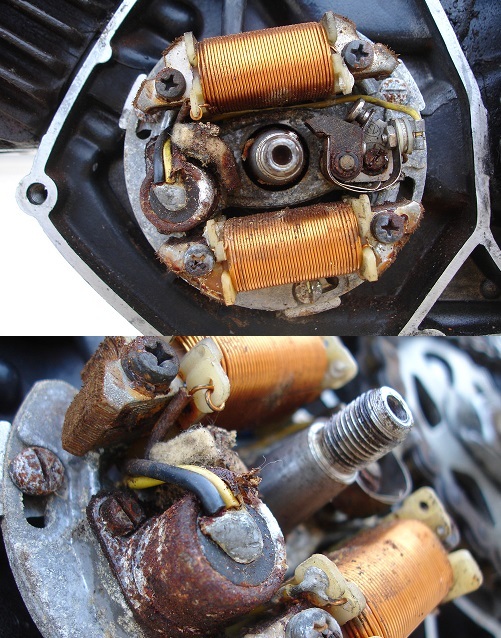 Most European-made mopeds have high quality C.E.V. 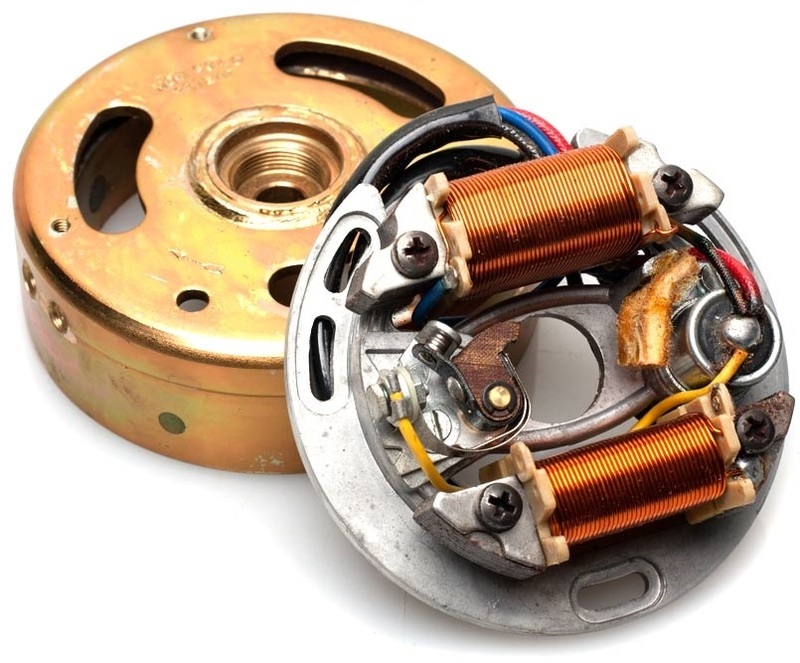 electrical components, made in Italy since the 1920’s by Fratelli Pagani (Pagani Brothers). C.E.V. is a trade mark that stands for Costruzioni Elettromeccaniche Venegonesi. English translation: Constructions Electromechanical of the Venegonese people (from Venegono, Province of Varese, Northern Italy). CEV is now part of ZADI. 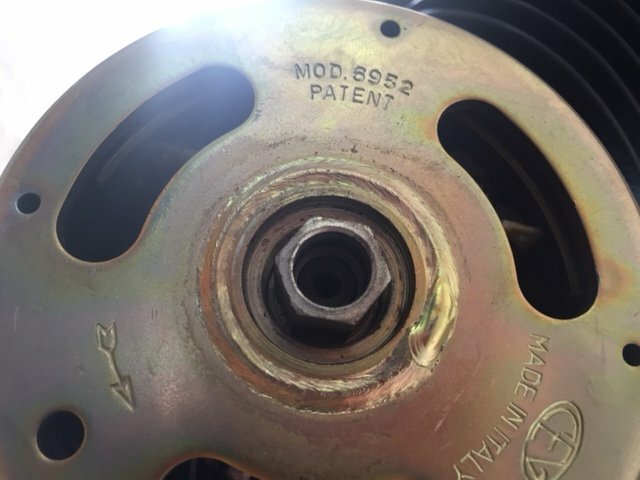 Listed in order of CEV model number on flywheel. Not for sale unless offered in the price list below. During 1986 Tomos transitioned from CEV to Iskra (Yugoslavian-made Bosch-compatible) magnetos, but nothing else changed. The Golden Bullet still had a 75 watt 2-wire magneto with internal ignition ground, and an external solid state voltage regulator. The Bullet still had a 28 watt (later 50) 3-wire magneto with external ignition ground, and no external voltage regulator. 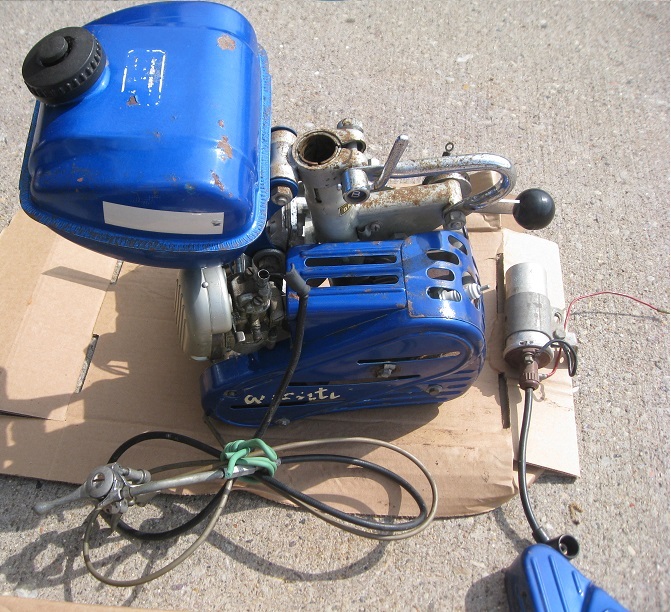 US-model Morini moped engines first had Dansi 1976-79 (MO1 and MO2), then Dansi or Bosch, 1978-84 (M1), then CEV magnetos in 1985-90 (M1), approximately. Besides the bottom lighting coil there is an additional thin lighting coil on top, wired in series. The top ignition source coil is thinner, to make room for the additional lighting coil. 1986 was the debut of solid-state voltage regulation, where all the lights are powered by one generator wire. This eliminated the need for multiple lighting output wires and source coils. The generator makes enough watts for all the lights to be on at once. But most of the time some of the lights are turned off. Then the extra watts are absorbed by the regulator, and “wasted” by warming up the frame. So the lights always stay the same brightness, no matter how many are on or off. 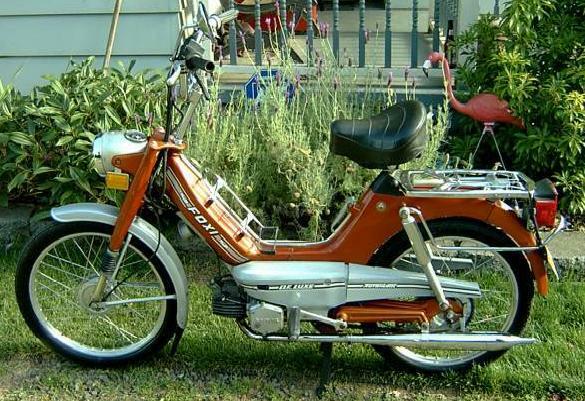 No more external ignition ground means the engine never looses spark because of the lights, like pre-1987 Tomos. Same as 6940. 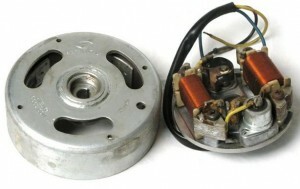 For early to mid 1970’s Minarelli V1 with metal fan cover, 2 (not 3) cover base screws, 94mm 3-screw stator plate mounts. For early to mid 1970’s Minarelli V1 with metal fan cover, 2 (not 3) cover base screws, 94mm 3-screw stator plate mounts. This aluminum flywheel has the same 80mm ID, but a bigger OD. It was superseded by 6940, with smaller OD. That is why there is room for a bigger flywheel on Minarelli V1 engine cases. A lot of older bikes had bigger flywheels. For late 1970’s to late 1980’s Minarelli V1 with plastic fan cover, 3 (not 2) cover base screws, 80mm 2-screw stator plate mounts. These crack at the points cam when over tightened. The flywheel center is weak, because the center tapered hole is wide, and the key groove is located where the outer cam surface is low. There isn’t enough thickness there to handle a large tightening torque. This has the same dimensions and timing angles (key-to-cam, and key-to-magnet) as 6951, but more watts and volts. This was not in any late 1980’s Tomos USA parts manual. It was on some bikes as a “random” substitute magneto, perhaps for when the normal Iskra 12V 75W magnetos were temporarily unavailable. 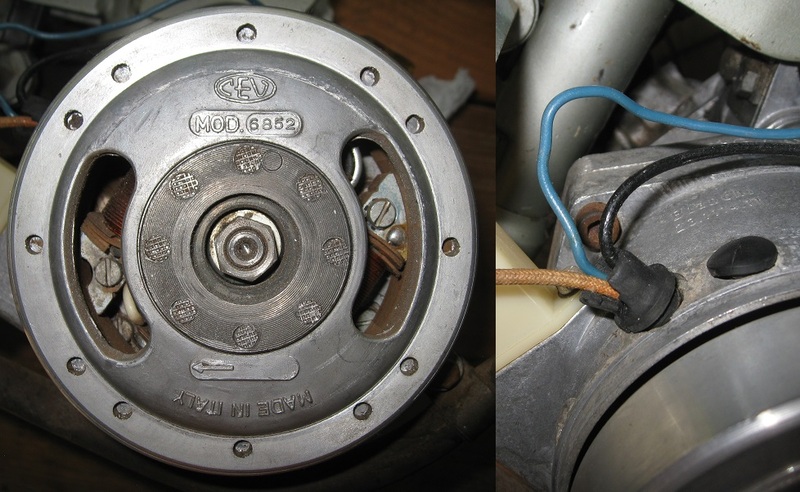 Most Sachs engines have Bosch magnetos. Some have Motoplat. This one has CEV. 1974-82 Tomos A3 magnetos were Ducati Elettrotechnica 31.17.30. 1983-85 Tomos A3 magnetos were ZEM 31.17.30, identical to Ducati. 1985-86 Tomos A3 ones were CEV 6951, interchangeable with Ducati. 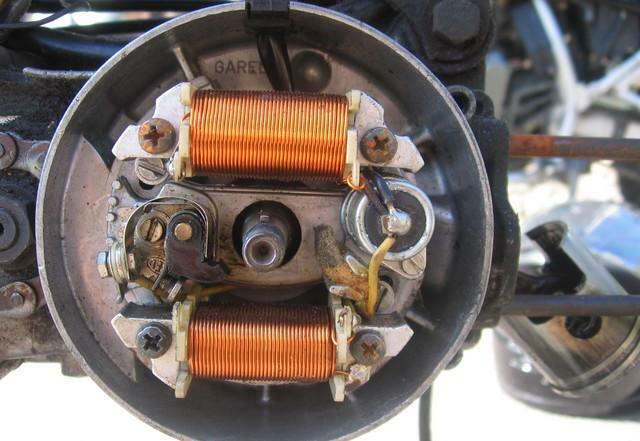 There are many different CEV moped magnetos, but many parts interchange. There are 3 base plates 80mm 2-screw, 94mm 3-screw, and 90mm 3-screw. There are two flywheel inner diameters, 80 or 90mm. CEV points are left (clockwise) or right (anti-clockwise). 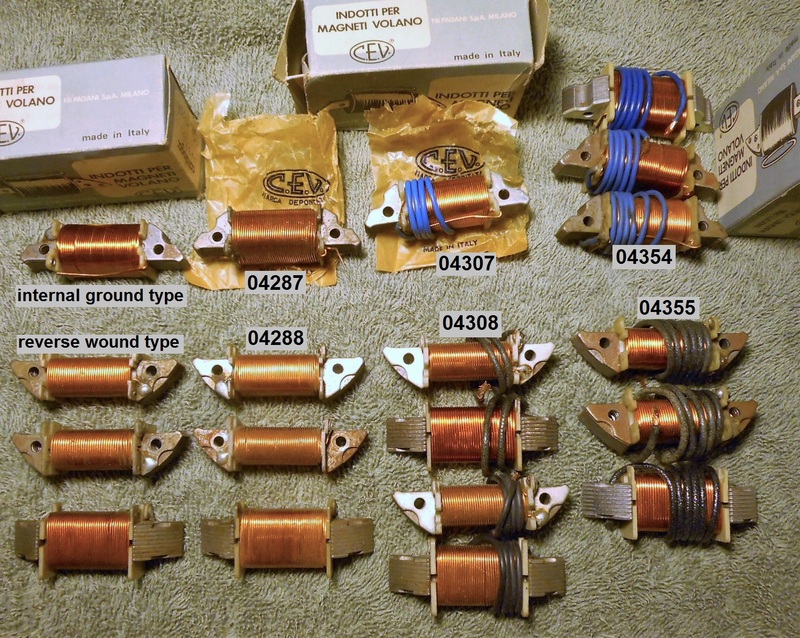 Source coils are all wound the same, with 2 sizes, for either 80 or 90mm flywheels. Each source coil has 3 different part numbers, because the wire is different, not the coil itself. That is one of the deepest secrets of CEV. 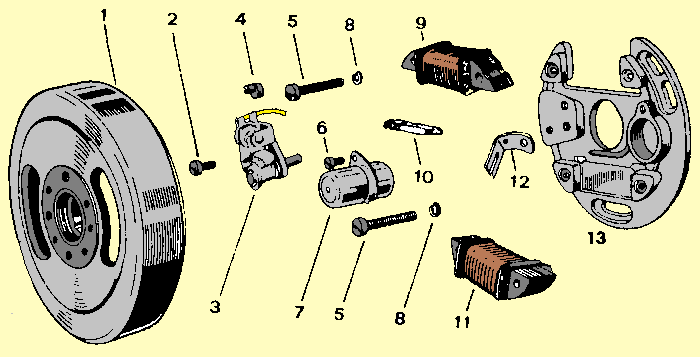 The flywheels generally do not interchange because they can have different timing angles. The timing angles are 1) the angle between key groove and the egg-shaped points cam, and 2) the angle between the four magnets and the key groove. Also the key groove can have different widths, 2.0, 2.5, or 3.0mm. 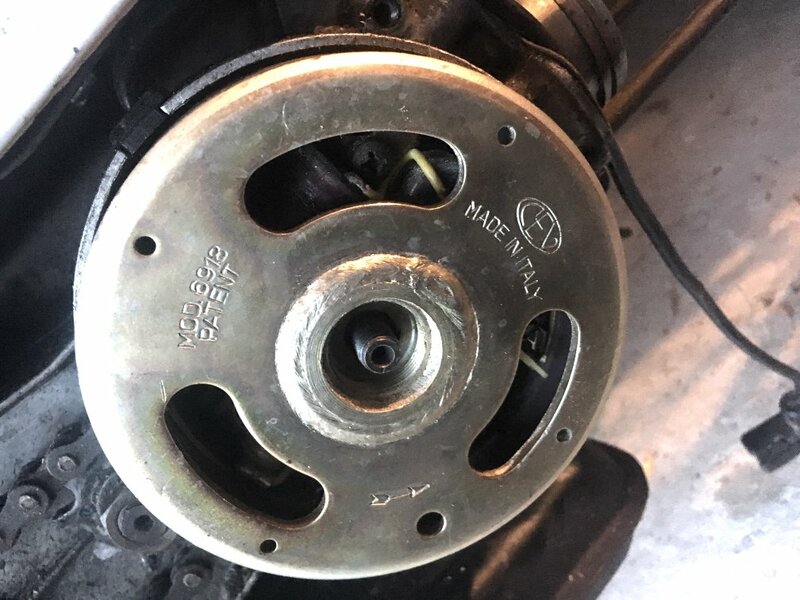 It is very technical, but two flywheels with the same size and rotation can interchange if the flywheel is installed without the woodruff key, at the correct angle. French mopeds do not have woodruff keys. The key is more for convenience in servicing, rather than for preventing slippage. 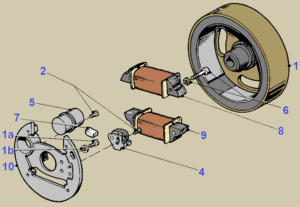 The flywheel-magnet-rotor model number identifies both the flywheel and the stator. Sometimes two flywheels can interchange because they are for the same engine, but with different stator versions. Not all of the CEV part numbers are known. 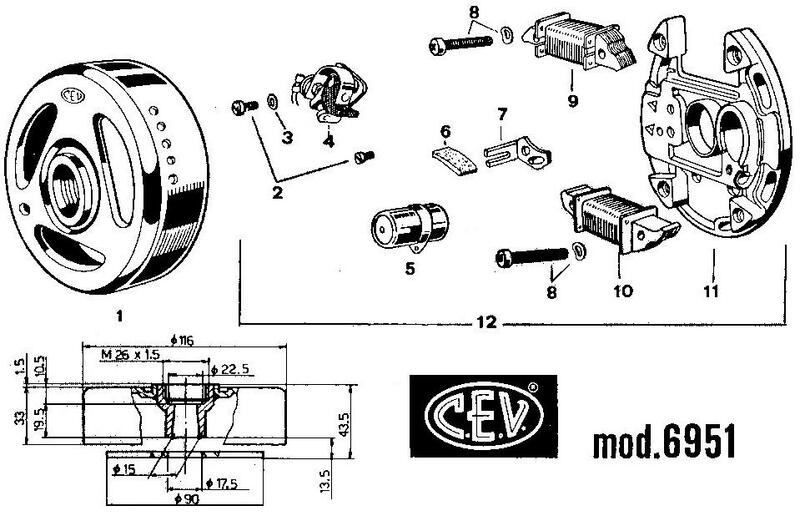 But the CEV part number is not necessary. Instead use the precise descriptions to specify the part. 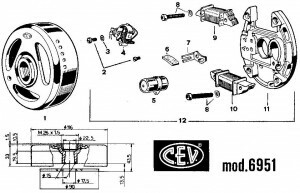 The CEV part numbers came from a 1985 Marina Mobili Inc (MMI) price list and from the CEV section in their catalog-notebook. They were the biggest USA importer and distributor of CEV parts and other moped parts, independently of the bike brands. Most bike makers parts catalogs do not disclose the component makers part numbers. So much of this information was gathered from actual parts samples that came from known bike models. You are currently browsing the archives for the CEV category.